You need McKee’s 37 Wax Remover for Plastic in your detailing arsenal. 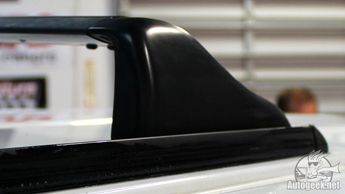 Whether you only detail your own cars or you detail cars as a business, you know how frustrating it is to remove dried wax, compound or polish residue off of plastic, vinyl and rubber trim. It’s a real pain! Guess what? McKee’s 37 Wax Remover for Plastic actually works, so you can feel confident with your purchase! Keep a bottle or two in your cabinet of detailing supplies; you’ll need it sooner or later. Stuff happens. 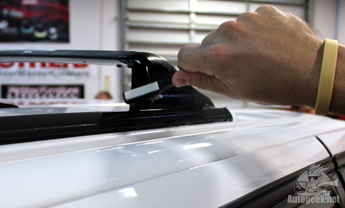 It’s so easy to accidentally get wax, compound or polish residue onto plastic, rubber and vinyl trim surfaces. What takes only a few seconds to do can take hours to remove and then you never really get 100% of the residue off leaving a white stain that bothers you every time you look at your car. McKee’s 37 Wax Remover for Plastic erases 100% trace residue of ALL polish, compound and wax residue on rubber, vinyl and plastic exterior trim. And it does so QUICKLY with minimal effort. The first time I used this I knew it was a home run product simply because it worked and worked well. Dried wax that’s impacted onto and even into trim components has to be one of the most difficult things to remove. Not so with McKee’s 37 Wax Remover for Plastic. This product goes to work dissolving old wax, compound and polish residue to you can wipe it off. Really stubborn or old wax stain will require scrubbing with a stiff nylon brush or scrubbing with a microfiber or terrycloth towel, that’s to be expected. The good news is though that even aged stains can be removed using McKee’s 37 Wax Remover for Plastic. Just spray it on, scrub and rub the area and then wipe the residue off to reveal clean trim again. Step 3: Spray McKee’s 37 Wax Remover for Plastic onto the affected area. Allow to penetrate for about 30 seconds. 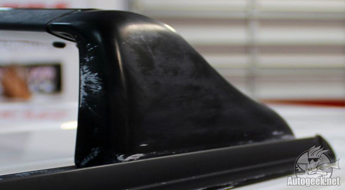 Step 6: Seal and protect the surface using McKee’s 37 Trim Detailer.